Blackburn Rovers say "it could be a couple of months" before they appoint a manager to replace Sam Allardyce. Allardyce was sacked by the club on Monday and Steve Kean was placed in temporary charge of the first team. "It's a very prestigious decision so we have to take some time," said Venkatesh Rao, one of the club's owners. "There's nothing personal against Sam," he added. "He's a very sweet and nice person, but we want a younger and more energetic appointment." Allardyce was sacked despite Blackburn sitting 13th in a very congested Premier League table, just three points behind Sunderland in seventh. Speaking to BBC Radio Lancashire, Rao added: "It was a very difficult decision but it was done to improve the situation at the club. "We want to do good for the club and want to see it doing well, like every other owner wants." The club, who are now without a manager with the January transfer window approaching, appear to prefer a British manager to succeed Allardyce but are also keeping their options open. Anuradha Desai, chairwoman of the club's Venky Group owners, told the Lancashire Evening Telegraph: "Our thinking now is that it will be a British manager, but we are open if there is an outstanding candidate who would be really, really good for the club. "Right now Steve Kean will take over while we are looking for someone to take over on a permanent basis. "Steve is a hard worker and he is doing a very good job as a coach. "We have been studying him and have been very impressed. He works long hours and is talented at his job." 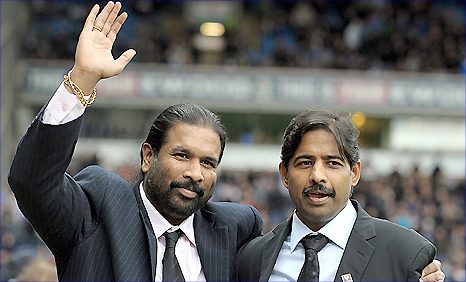 Blackburn became the first Indian-owned Premier League club when they were taken over by the Rao family, who own the Venky's group, in a £43m deal in November. Their decision to part company with Allardyce came as a surprise to the club's players, captain Ryan Nelsen saying he did not see it coming "in his wildest dreams". But, even though a difference of opinion in the way forward for the Ewood Park outfit appears to have sealed Allardyce's exit, Desai has asked Rovers fans to trust the new owners. "We do not mean anything bad for Sam Allardyce but we feel that we need to take the club up in the league and grow," she added. "We want Blackburn to be fourth or fifth in the league or even better. It is not about the Bolton match. It has been a long time in our minds. "It is nothing against Sam but we have a different vision looking forward and we want the club to grow. "We had been talking to Sam for the past few weeks and he did not fit in with our vision for the club's future. "We wanted good football, wanted the games to be interesting and, of course, wanted to win and to have good players. "We needed to make some changes and Sam going is of course the main change. This is a major step - but we thought 'why delay?'. "The fans should trust us and have belief because this is in the best interests of the club." Ever since Allardyce's sacking on Monday, bookmakers have been speculating over his successor, with former Tottenham boss Martin Jol and ex-Newcastle manager Chris Hughton among the frontrunners. Former Blackburn captain Tim Sherwood is also being linked with the job but says he is content working as assistant coach to Tottenham boss Harry Redknapp. "I'm happy learning under the best manager you could possibly have at the moment," said Sherwood. "I'm busy gaining my qualifications at a great club but who knows when new opportunities arise? I have not been approached but 100% I want to be a manager. "Blackburn are a great club, a fantastic club, the best club I've ever played for, even if they were not the biggest."